President Bush on Wednesday accused Congress of dragging its feet on key pieces of legislation, urging quick action on budget and children's health measures. But foreign relations ended up dominating Mr. Bush's press conference, starting with his relationship with Russian President Vladimir Putin, reports CBS News chief White House correspondent Jim Axelrod. If Tuesday's handshake between Putin and Iranian President Mahmoud Ahmadinejad troubles Mr. Bush, he didn't let it show at his news conference. "I think it's hard to judge how their conversations went from a picture," said President Bush. Mr. Bush is betting Putin will be on the same page opposing Iran's nuclear weapons ambitions that he was on this summer, adds Axelrod. "We spent a lot of time talking about the Iranian issue, and we both agree," said President Bush on July 2. In light of current problems with Russia, CBS News chief Washington correspondent Bob Schieffer noted how Mr. Bush didn't want to say anything about Putin until they talked in private about his recent trip to Iran. "I think it was very interesting he wouldn't criticize him at all," said Schieffer. Mr. Bush also urged the Democratic-controlled Congress to drop efforts to pass a House resolution labeling as genocide the World War I-era killing of up to 1.5 million Armenians in the final years of the Ottoman Empire. With all the pressing responsibilities facing the nation, "One thing Congress should not be doing is sorting out the historical record of the Ottoman Empire," he said. "Congress has little to show for all the time that has gone by" since Democrats gained control in January of both the House and the Senate, Mr. Bush said. The president also said that Congress needs to act on mortgage relief for homeowners hit by the housing crisis, trade deals that would strengthen allies, legislation expanding U.S. markets and aid to military veterans. Mr. Bush also said that he opposes Turkey's desire to launch a military offensive against Kurdish rebels in Iraq. "We are making it very clear to Turkey that we don't think it is in their interest to send troops into Iraq," Mr. Bush said shortly before Turkey's parliament approved a cross-border military offensive against the Kurdish rebels in northern Iraq. "Actually they have troops already stationed in Iraq and they've had troops stationed there for quite a while," he said. "We don't think it's in their interest to send more troops in." Mr. Bush said he talked about Turkey with Ryan Crocker, U.S. ambassador to Iraq, and Gen. David Petraeus, the top U.S. commander in Iraq, on Wednesday. He also noted that Tariq al-Hashimi, one of Iraq's vice presidents, was in Istanbul expressing that Iraq shares Turkey's concerns about terrorist activities. But Mr. Bush said there's a better way to deal with the issue than having Turkey send additional troops into the country. "What I'm telling you is that there's a lot of dialogue going on and that's positive," he said. Mr. Bush used the news conference - his first since Sept. 20 - to prod the Democratic-controlled Congress to approve spending, education and health bills. It came just a day before the House will try to override his veto of a bill expanding a popular children's health program. "It's unlikely that veto override will succeed," Mr. Bush said noting that Democratic leaders knew that "when they sent me the bill." Mr. Bush also defended his decision to attend a ceremony in the Rotunda of the U.S. Capitol later Wednesday to award Congress' highest civilian honor to the Dalai Lama, the exiled spiritual head of Tibet's Buddhists. "One, I admire the Dalai Lama a lot; two, I support religious freedom, he support religious freedom," he said. The reception the Dalai Lama was getting in the United States infuriated the Chinese government, which reviles the Buddhist leader. Said it was important for Secretary of State Condoleezza Rice, on a diplomatic mission to the Middle East, to help Israelis and Palestinians make progress leading to a scheduled upcoming peace conference in Annapolis, Md. "The Palestinians that have been made promises all these years need to see there's a serious focused effort" to set up a Palestinian state, he said. Mr. Bush promised that the conference in Annapolis would be "serious and substantive." He said one reason for holding the conference is to get what he called "Arab buy-in" for a Palestinian state. 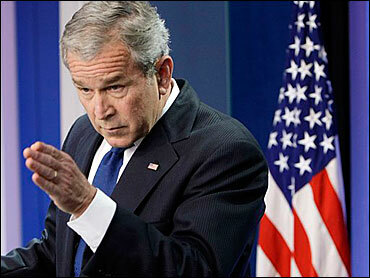 "Part of the issue in the past has been that the Arab nations stood on the sidelines," Mr. Bush said. "And when a state was in reach, they weren't a part of the process, encouraging the parties to move forward." Declined to counter retired Lt. Gen. Ricardo Sanchez, who said recently that the American mission in Iraq was a "nightmare with no end in sight" because of U.S. misjudgments. "The situation on the ground has changed quite dramatically since he (Sanchez) left Iraq," Mr. Bush said. Said he is looking forward to the final 15 months of his presidency and denied that he was losing leverage as a lame duck president. "Quite the contrary. I've never felt more engaged and more capable of helping people recognize - American people recognize - that there's a lot of unfinished business." Continued to fend off questions about a recent Israeli bombing raid inside Syria, suggesting reporters were not going to get any different answers from him no matter how hard they tried. "This is not my first rodeo," he said.